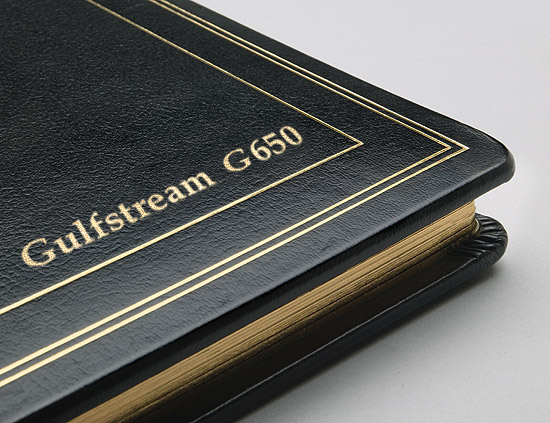 Whether its your sales presentation or a gift to a special customer these hand crafted custom leather albums show the recipient you and your company take pride in all the work you do. When the job is finished this album frames the months of work and painstaking craftsmanship and preserves the pristine condition you delivered the aircraft in. No other gift or sales tool says so much about your quality standards. You have spent the time to acquire the finest photographs available now its time to display your work in the best way possible. These fine leather albums are available in many different standard colors as are the complementing gold or silver bordered mats that envelop each mounted photograh. 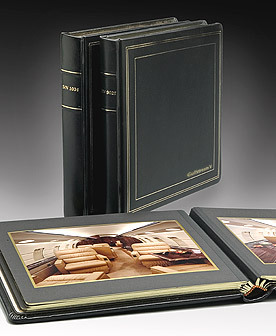 Because every album is hand-made customer supplied leather, matching the interior of the aircraft, can make your customer album an especially unique gift. Gold stamping on the spine, front and inside cover is available. All prints are sprayed with a protective lacquer and are individually mounted to each page. The hand done matting and hand stitched spines are done at no extra charge. Available panoramic photos spanning 2 pages deliver a dramatic photographic story that clearly shows off your work in a unparalleled manner. The photos on this page show some of the quality details that come standard with every album. Please give us a call for final pricing and delivery times. Custom Leather Albums start at $400.00. All prints in the album are included in the price.